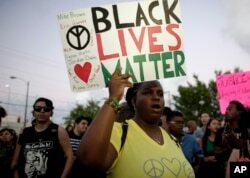 The Black Lives Matter movement is renewing calls to end police brutality and is pushing for criminal justice reforms across the United States. The social movement is trying to influence public opinion while deflecting criticism it has not created enough positive change. "No Justice! No Peace!," demonstrators chanted as part of a loud cry heard around the country in 2015. Thousands of supporters were demanding sweeping changes to the nation's criminal justice system. The movement, formed in 2012, has been gaining support over the past two years following a series of high-profile police encounters that led to the deaths of unarmed African Americans. Activists say they want to end what they describe as police brutality and racial discrimination in mostly black neighborhoods. Black Lives Matter member Dennis Rodriguez says the movement is growing. "The movement has opened our eyes to everything," he said. "It has helped us [people of color] understand that while we may not be seen as human or powerful currently that the fruits of our labor will soon come." FILE - Desiree Griffiths holds up a sign saying "Black Lives Matter," with the names of Michael Brown and Eric Garner, two black men killed by police, during a protest in Miami, Florida, Dec. 5, 2014. Black Lives Matter has been increasing its profile through street protests and a strong social media campaign. The movement is pressuring lawmakers and potential presidential contenders to address their concerns. "It has prompted us to start talking about police reform again that we had ignored since September 11th, 2001, when we had been more focused on national security rather than community policing," said political analyst Elsie Scott. "I want to deal with what we can do to keep people from putting themselves in situations where you get bad outcomes," said E. W. Jackson, a pastor and conservative community activist. Jackson says Black Lives Matter should put as much emphasis on the dozens of daily black-on-black homicides as opposed to focusing solely on killings by police officers. "If you paint the picture that all of your problems have to do with race or have to do with police brutality then it seems to me you are avoiding essential issues," he said. But attorney and Washington, D.C. community activist Nkechi Taifa disagrees. "It is not to say that all lives do not matter. What it means is that specific attention at this period, at this time, needs to be placed on people who are most adversely impacted by the laws and policies that are going on," she said. Yet former police officer Leon Threatt believes Black Lives Matter has been more divisive than a uniting movement. "It should not be the police against the community," he said. "It should be helping to create an environment or a platform for community oneness [to] bring those parties to the table talking about trusting." Leaders of Black Lives Matter say the organization is working to build relationships with police departments. They say they will continue to stage street protests to highlight deadly or violent confrontations between black men and police officers.